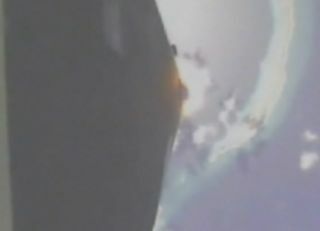 A view from SpaceX's Falcon 1 rocket shortly before video transmission terminated two minutes and 20 seconds into the third test flight on August 2, 2008. A SpaceX spokesperson said that mission control had reported an "anomaly." AFalcon 1 rocket failed to reach orbit late Saturday, marking the thirdunsuccessful attempt for private spaceflight-firm SpaceX. Tworocket stages failed to separate about two minutes and 20 seconds into launchfrom the U.S. Army's Reagan Test Site on Omelek Island in the Kwajalein Atoll,about 2,500 miles southwest of Hawaii in the central Pacific Ocean. "Itwas obviously a big disappointment not to reach orbit on this Flight 3 of theFalcon 1," said Elon Musk, SpaceX chairman and CEO, in a short statement readto reporters by Diane Murphy, SpaceX vice president of marketing andcommunications. The problem is still under investigation by SpaceX. Therocket lifted off at 11:34 p.m. EDT after an earlier aborted attempt, and seemedto make headway until the video transmission abruptly terminated. TheFalcon 1 was carrying a smallsatellite called Trailblazer for the Pentagon's Operationally ResponsiveSpace Office. The microsatellite represented a rush order for Poway,Calif.-based SpaceDev. Twosmall NASA satellites were also part of the lost payload, including an ultra-thinsolar sail called NanoSail-D and a micro laboratory called PRESat. SpaceX'sFalcon 1 rocket stands about 68 feet (21 meters) tall and carries a reusablefirst stage to launch payloads of up to 1,256 pounds (570 kilograms) intolow-Earth orbit. The two-stage booster weighs 60,000 pounds (27,200 kilograms)at liftoff. Its Merlin 1 rocket generates 77,000 pounds of thrust. Theincident comes on the heels of two previous Falcon 1 launches that falteredshort of reaching orbit. The first attempt in March 2006 ended with a fuelline leak and fire due to a corroded nut. The secondattempt in March 2007 saw the Falcon 1 get almost 180 miles (289 km) aboveEarth and near orbital velocity, before the rocket's second stage engine shut downbecause of fuel slosh and roll control issues. Thethird attempt was originally slated as a lateJune liftoff from the U.S. Army's Reagan Test Site in the central PacificOcean. However, a tinyweld defect in an engine nozzle led SpaceX to delay the launch attemptuntil today. Despitethe setbacks, Musk vowed in his statement — which he also read to SpaceXemployees — that SpaceX would press forward with plans for Falcon 1's fourthflight. He added that SpaceX recently received a major investment to continue developingheavy-lifter Falcon 9 and the Dragon spacecraft that might one day ferry cargo orcrews to the International Space Station. "Formy part, I will never give up and I mean never," Musk said. Thisstory was updated at 1:40 a.m. EDT on August 3.